Amy-Faye Johnson’s beloved book club, the Readaholics, enjoys guessing whodunit in mysteries like The Maltese Falcon. This promising series is addictive! A series that readers will delve right into. Extremely well written. The mystery unfolds at the perfect pace … I am definitely looking forward to the next installment. Laura DiSilverio hits it out of the park…Engaging characters. Beautiful setting. Readers will be enchanted. Smart, fast-paced, and fun. 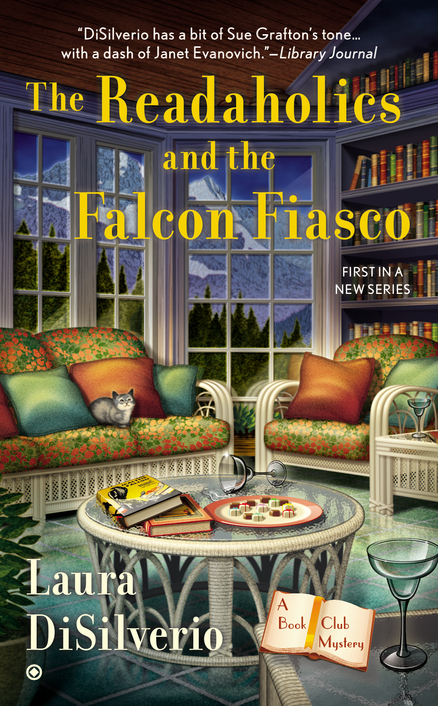 Laura DiSilverio’s first book in her excellent new Book Club Mystery series features an appealingly clever protagonist and her witty group of Readaholics who dissect great books while solving intricately plotted murder that kept me turning pages late into the night. I never wanted to put this book down. 5 Stars. Other Books in "Book Club Mysteries"